State-of-the-art analysis of geological structures has become increasingly quantitative but traditionally, graphical methods are used in teaching. 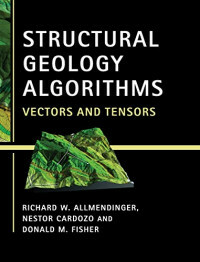 This innovative lab book provides a unified methodology for problem-solving in structural geology using linear algebra and computation. Assuming only limited mathematical training, the book begins with classic orientation problems and progresses to more fundamental topics of stress, strain and error propagation. It introduces linear algebra methods as the foundation for understanding vectors and tensors, and demonstrates the application of geometry and kinematics in geoscience without requiring students to take a supplementary mathematics course. All algorithms are illustrated with a suite of online MATLAB functions, allowing users to modify the code to solve their own structural problems. Containing 20 worked examples and over 60 exercises, this is the ideal lab book for advanced undergraduates or beginning graduate students. It will also provide professional structural geologists with a valuable reference and refresher for calculations.